Would you rather have your boring desktop space filled with useful system information or family photos? 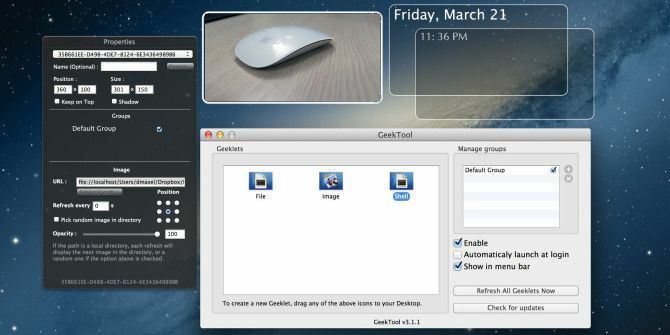 If your desktop is looking a little boring you can add an extra layer of customization with GeekTool, a Mac OS X application which adds applets to your desktop called “geeklets”. These are similar to gadgets and widgets in Windows Miss Gadgets & Widgets On Windows 8? Here's How You Can Get Them Back Miss Gadgets & Widgets On Windows 8? Here's How You Can Get Them Back Microsoft removed gadgets, the desktop widget feature introduced in Windows Vista, from Windows 8. Microsoft would prefer you use live tiles on the new Start screen to get information – but what if you want... Read More and Conky, a very similar desktop enhancement for Linux. Just how flexible are these geeklets? Let’s find out. GeekTool comes with three different geeklets – text, image, and shell. A text geeklet allows you to display the contents of any plain text file. As an example, if you use the todo.txt method of keeping a to-do list, then this is a perfect way to display your to-do list on your desktop at all times. You can also set formatting options for font and color. An image geeklet unsurprisingly allows you to display an image on your desktop. Since you can resize geeklets, you can resize the image to whatever dimensions you’d like. You may also choose an image using a URL rather than choosing a locally-stored image – which can also include a dynamic image that often changes. What’s more, you can choose an entire directory of images for GeekTool to display. Everything is customizable of course – you can tell the geeklet to refresh after a certain amount of seconds, set the opacity as well as choosing whether to run in order or randomly. Finally, a shell geeklet allows you to display the output of a terminal command. This requires some knowledge of terminal commands, or the ability to find them on the web. You can use the shell geeklet to display just about anything since terminal commands are so flexible. You could display the date, time, and calendar, or a list of the top running processes that use the most amount of system resources. This is by far the most useful geeklet of all, but you’ll need to know your commands in order to get the best use out of it. Here’s an excellent list of GeekTool shell commands compiled by MacRumors forum members – simply place them in the “command” field under your geeklet’s properties. If you’re new to the Terminal, you can broaden your knowledge with five useful commands 5 Fun & Useful Terminal Commands You Can Use More Than Once [Mac & Linux] 5 Fun & Useful Terminal Commands You Can Use More Than Once [Mac & Linux] There is a ton of information on the Internet about various Terminal commands and ways to customise your Mac or Linux machine with the Terminal. Here are some commands which are really useful and can... Read More , four simple commands 4 Fun And Simple Things You Can Do Using Terminal [Mac] 4 Fun And Simple Things You Can Do Using Terminal [Mac] Read More , and the many other things you can do in a Mac terminal 4 Cool Things You Can Do With The Mac Terminal 4 Cool Things You Can Do With The Mac Terminal The Terminal is the Mac OS X analogue of the Windows command prompt, or CMD. It's a tool, as you probably already know, that allows you to control your computer using text commands, as opposed... Read More . GeekTool is a very flexible tool and can do a lot to spice up your desktop. It’s completely free to download and use, so why not give it a try? What interesting desktops have you created thanks to GeekTool? Do you have any useful commands you could share with others for use in the shell geeklet? Let us know in the comments! I can't drag geeklets to my desktop, any suggestions which could help me. operate. I have ssh working from each of them to the others. How would I alter the geeklet script so that it gets me the usage for those remote servers? You can never truly make a Mac your own. Macs are like cats - they condescend to let you live with them and feed them. "Your" Mac is fed by being permanently attached to your bank account by an umbilical cord, whether you like it or not. You can kind of "own" a Windows PC, but you are a hostage to "updates" for the rest of your life. It is more like a dog - a faithful friend that often works quite long and hard for it's food. The only sure way to own your PC is to run Linux. As it is a wild bird, feeding it is entirely optional. I am not attacched to any bank account on my Mac, why should I? If you want to buy something from the store (but you not have to) you can use a itunes gift card to open an account and never put you credit card in there. Exceptionally cool! What does all of that do to your system load? I use it on my MacBookPro all the time! Most of my geek lets run every minute or so doing cpu, disk usage, trash size, weather, showing todo lists, reminders, upcoming calendar events, pinging some sites I monitor, showing time, etc. Essentially no impact on performance. Remember, these things are mostly running the idle loop unless you are doing some heavy duty background task or rendering! Where is the *** link to the application? Thanks for the heads-up D! Links have now been added. You can download GeekTool here.